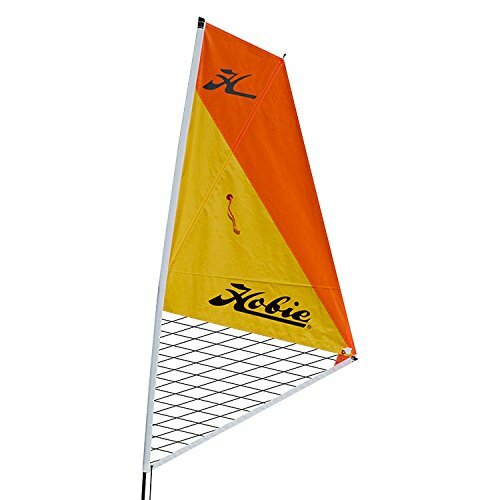 Add the Hobie Kayak Sail to your Hobie Mirage kayak, and it works great with the Hobie Mirage Outback, Sport, Adventure, Revolution, Pro Angler, Outfitter and Oasis to make an amazing little sailboat. Easy to use, you steer with your fingertips, control the main sheet with your other hand and pedal with your feet. The fins of the Mirage Drive provide great lateral resistance for sailing upwind. The two-piece mast features a boomless sail and a diagonal batten that allows it to be easily rolled up and stowed in the included storage bag.